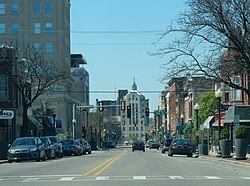 Motto(s): "The Government Closest To The People"
Rockford is the third lairgest ceety in the U.S. state o Illinois, the 171st maist populous ceety in the United States, the lairgest ceety in Illinois ootside o the Chicago metropolitan aurie, an the ceety o the 148t maist populous metropolitan aurie in the Unitit States. ↑ "2016 U.S. Gazetteer Files". United States Census Bureau. Retrieved Jun 30, 2017. ↑ "Rockford (city), Illinois". State & County QuickFacts. U.S. Census Bureau. 8 July 2014. Retrieved 15 September 2014. ↑ "Annual Estimates of the Resident Population for Incorporated Places of 50,000 or More, Ranked by July 1, 2013 Population: April 1, 2010 to July 1, 2013". U.S. Census Bureau, Population Division. May 2014. Retrieved 16 September 2014. ↑ "Estimates of Resident Population Change and Rankings: July 1, 2012 to July 1, 2013". U.S. Census Bureau, Population Division. March 2014. Retrieved 16 September 2014. This page wis last eeditit on 16 Februar 2018, at 22:16.